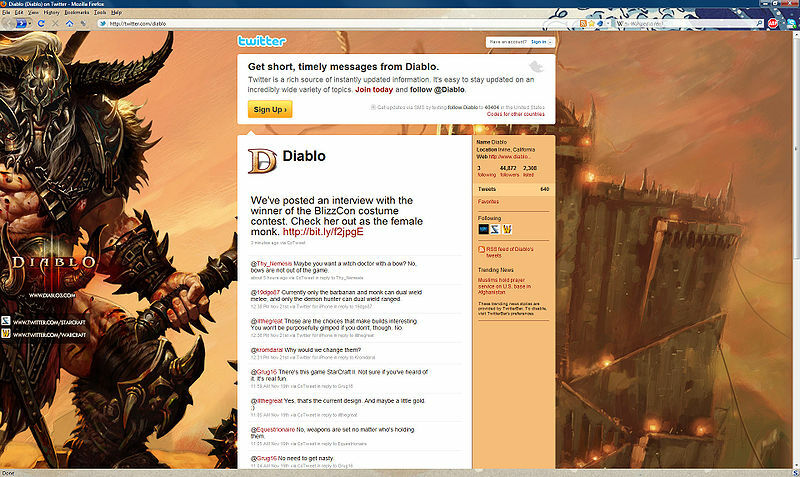 @Diablo refers to Blizzard's official Diablo twitter account, which can be viewed here. Blizzard announced their @Diablo, @Starcraft, and @Warcraft official twitter accounts in September 2009, and the tweeting began just a few days later. News items that quote the best tweets from official Blizzard sources can be seen here. Initial fan reactions to Blizzard's Twitter innovation were quite mixed, due to a general "I hate Twitter" attitude amongst many. Fans questioned the value of the service, with its limit of 140 character per post, and some early misunderstandings brought about by the short messages seemed to bear this out. After a few months though, fans began to see the value of daily updates and questions being answered, even with very short replies, and the service became well-accepted by the Diablo community. In November 2010, a little more than a year after it began, @Diablo had posted over 600 tweets and had around 44,000 followers. Those figures had increased to 1,390 tweets and 115,868 followers as of March 2012. @Diablo is updated by Bashiok and several other Blizzard community managers, who seldom identify themselves in their tweets. After a couple of years of busy activity, during which time Bashiok was responsible for the vast majority of the updates, the frequency of @Diablo tweets began to decline in 2011, especially after Bashiok and other Blizzard employees began tweeting more regularly from their own accounts. As of early 2012, @Diablo is issuing only a tweet or two a day, all of which are notifications of official site updates or answers to very basic questions about Diablo III. As such the service has become of little value to knowledgeable fans, all of whom rely on forums, fansites, and blue trackers to keep up on the most current news. In addition to @Diablo, regular Diablo information is disseminated by the personal accounts of several Blizzard employees. Community manager Bashiok tweets from @Bashiok. Diablo 3 Game Director Jay Wilson tweets from @Angryrobotics. Community manager Zarhynm tweets from @TalkingCongas. The issue of Blizzard employees mixing business with pleasure on their private twitter accounts came to a head in early January 2012, as release date-irate fans began complaining about the non-Diablo content coming from the twitter feeds. Zarhym replied to the complaint via a Battle.net forum thread. If you’re looking to our personal Twitter accounts for any hints of information that might help you ascertain a release date of Diablo III, you’re going to be disappointed. I’m assuming you’re referring to my tweet about a “big meeting.” I have several meetings a day and just felt like being silly on my personal feed on a Monday morning. Was it really enlightening or informative? No. Was there ANY indication that meeting had anything to do with Diablo III development or release? No. (Because it didn’t.) Do I sometimes tweet about the weather, cute cats, rocks on the ground, and other random stuff that won’t bring you any closer to your copy of the game? Totally. If you guys don’t have anything of importance to say please do us a favor and don’t say anything. Since everything you mentioned in your OP was taken from Twitter, I’m assuming you’re asking that we not use our personal social media accounts to communicate with anyone until our company announces a release date for Diablo III. The unfortunate fact is we’re human beings. We use social media to communicate with others about day-to-day affairs, whether or not what we’re saying pertains to our jobs. In the next few days we will be officially launching the @Warcraft, @StarCraft, and @Diablo Twitter feeds where we plan to share news, run contests and events, and much more. We’ll be starting things off with a bang by holding contests leading up to and through BlizzCon as well as will be twittering all through the show. We’re looking forward to the opportunities that will come with these new Twitter accounts and the increased interaction between Blizzard Entertainment and the community. @Diablo as seen November 22, 2010. The Barbarian @ Bastion's Keep background image has been unchanged since the account went live. This page was last edited on 7 March 2012, at 18:54.